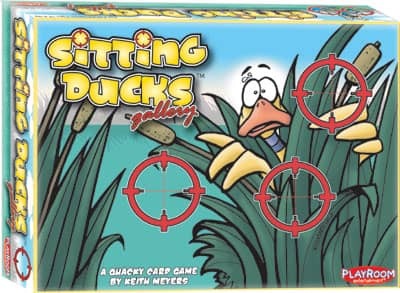 No duck is safe in Sitting Ducks Gallery, where the object is to maneuver your ducks down the row and avoid getting in the line of fire! Get your ducks out of the water before feathers start flying, because cards can target, shoot, or move the line in various ways! If your birds of a feather can stick together and keep from getting hit, you could be the last Sitting Duck in the lake! For 3 to 6 Players, ages 10 to Adult.